A retelling, set in the Old West, of the traditional story about two elves that help a poor bootmaker and his wife. The Boy Who Changed the World chronicles the influences that affected the life of Norman Borlaug, a man who would grow up and use his knowledge of agriculture to save the lives of two billion people. The influences include the lives of other people, including former Vice President, Henry Wallace; George Washington Carver; and Moses Carver, his father. The theme of the book is that the things we do are important and that they can actually change the world for the better. Victoria and Sam are forced to share or distribute a limited number of cookies. Each time the doorbell rings, more friends arrive and the children face a cookie scarcity problem. Big Bear, Rabbit, and other animals work hard to produce a newspaper for their own neighborhood. They divide up the labor to write, edit, and print a variety of stories. This is the touching story of a boy’s relationship with a tree, and how the tree provides for him throughout his life. The story describes the journey of a one-dollar bill as it changes hands. Special information about our paper money is included on each page. Geraldine is a goat. Her “friend” and owner, Glenmae, is a skilled Navajo weaver. One day, Glenmae decides to weave Geraldine into a rug! First Glenmae clips off Geraldine’s wool. Then she spins it into yarn, dyes it, and weaves the wool on her loom. 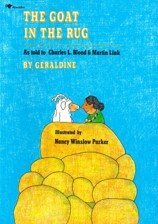 In this cleverly-written story narrated by Geraldine herself, students learn how natural and other resources are combined to produce a beautiful and unique rug. An African version of the familiar story, Caps for Sale. In this story, a man encounters difficulty from a group of mischievous monkeys on his way to the festival to sell his hats. Through this difficult situation, he learns an important life lesson. This book is the complete kids' guide to starting a business. There are eight great case studies on Kids in Business. Useful pointers are given on starting a business, choosing the right type of business, costs, advertising, and staying in business. Ants may be small in size, but they are mighty in how hard they work! Learn all about ants and ant colonies in this colorful, fact-filled, cartoon-like book. A Journey’s Selection. Interested in using this resource in your classroom?